Vedatrak Base Pack is the core package for Vedatrak CRM and is the essential feature of the system. Base Pack includes: Dashboard, Contacts, Calendar, Users, MultiLang and Themes. Additional modules can be purchased and seamlessly integrated with the Base Pack at any time. 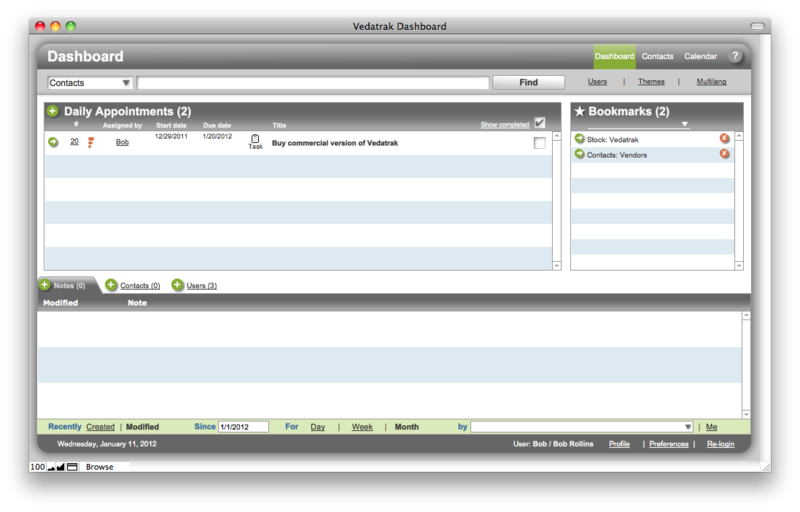 Each Vedatrak user can plan work by scheduling tasks and appointments. Appointments can be assigned to any user in the system and scheduled singly or on daily, weekly, monthly or yearly cycles. Each user can elect to receive e-mail notifications for new appointments and comments on existing appointments, log his work. Use Template module as a base if you want to build your own Vedatrak module and save your time. Vedatrak comes complete with five installed language sets - English, German, Russian, Turkey, French and Portuguese. Using the handy language editor, you can make new Interface language for the Vedatrak (if you can't to find your language in the supported languages list). The unit allows to create an unlimited numbers of such translations. * If you already purchased Vedatrak Base pack 2.1 and want to upgrade to Vedatrak Base Pack 3.1, you will be offered a special upgrade price. System will automatically check Your Downloads and define if you're performing an upgrade. Purchasing a support package in conjunction with Vedatrak Base Pack will enable you to rest assured that all technical aspects of using our product will be handled so you are free to provide you or your team with the professional support to effectively use it.